Easter egg in Windows XP... "Sometime this millennia"
Set your system clock to a date in the future (something far in the future; eg December 2030). 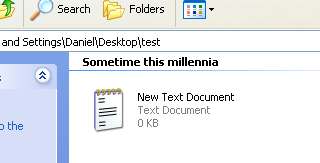 Create a new file (anything, a blank text document will do). Set the system clock back to the real date. Open the directory containing the newly-created file. Choose the View → Arrange Icons By → Modified option. Tick View → Arrange Icons → Show in Groups.